I have very much embraced neutrals this summer. Black and white is always a favorite of course but blue and white will be forever chic too. I recently added some fabulous blues to my wardrobe and my favorite way to wear blue is, you guessed it, with white. It’s a very effortless way to look chic and a great option if you ever wonder what to wear. Blue is softer than black and in terms of color will usually suit 40+ women better. My first look is the most trendy as it hints at the 70s trend. I’m not indulging much in this trend as boho chic (even though I love it on others) is not really my thing. 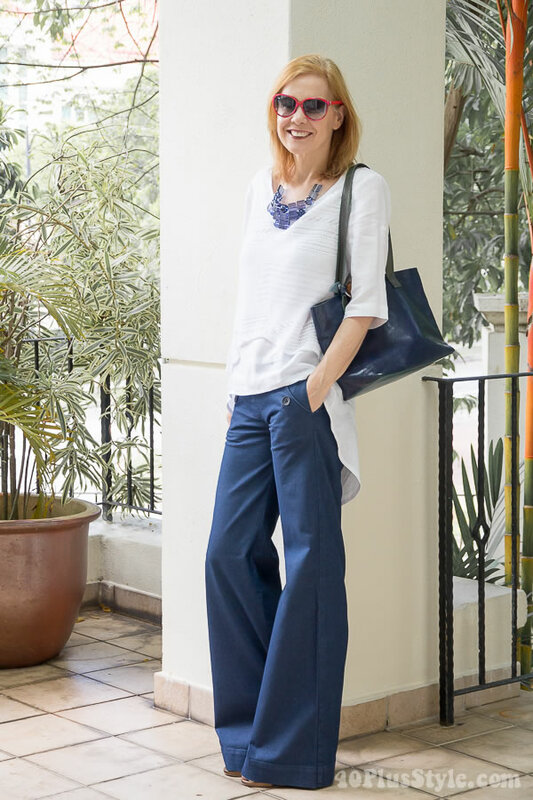 Instead I keep it simple and minimalistic with these blue flared pants that have been in my wardrobe for several years. They felt like the perfect base for this multilayered white top which is a hot summer version of the tunic I showed you earlier. The base is made of 100% hemp which is a similar fabric to linen. Lovely texture and it keeps you cool! The knit if made from linen. You can also reverse the order and wear navy on top. I absolute love this knitted asymmetrical top. I love how the pattern of the top is different when shown over your skin and over your camisole and creates great texture within the outfit. No necklace needed therefore and you can go a bit wilder with either earrings, sunglasses or bracelets. 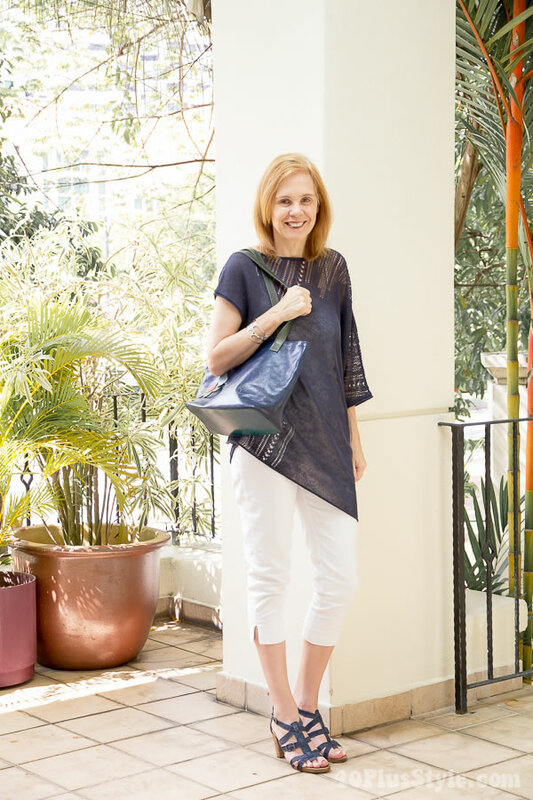 This top is perfect for summer as it is made of 100% linen. The beauty of knitted linen is that you get the coolness but not the wrinkles! I think this top would also look really good over jeans. Today’s last look features another great design. This top drapes like a cacoon across your body. Made of 100% hemp, it’s super light and super cool. In many ways it is much like linen even though it is a bit more structured. Bare in mind therefore, that it will also wrinkle really easily (as can be seen on the photos), so if you mind wrinkles in your clothes too much than pure hemp is not for you.